Before the official announcement post, Paul Clarke mentioned several upcoming events, one of which was this MxMo, but I glanced quickly at it and misread the theme as "Monkey Drinks." I was anxiously awaiting Kevin's announcement wondering what that meant, and commented thusly about my mistake once he posted it, if you are wondering what Paul was talking about on the MxMo website. But I guess "Monkey Drinks" is for another episode. 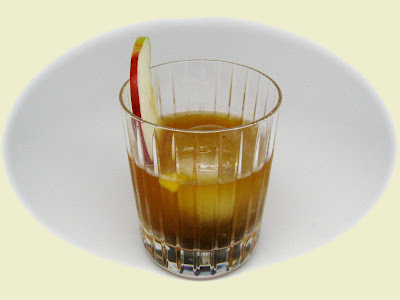 stir and strain into double old fashioned glass with one giant cube***, top with dash balsamic, garnish with slice of Cortland apple (they don't brown!). ½ oz of the sauce sounds like a lot, as it is sweet, but roughly half is chunks of fruit that will (mostly) stay in the stirring vessel. *To infuse the cognac, do a simple fat wash with the rendered fat (don't let it burn!) from cooking the foie gras using the same procedure as you would for Bacon-infused bourbon. This infused cognac is also a damn fine sipper, feel free to drink unadulterated. Dice the pear. In a thick bottom pot make a caramel with the sugar. (I add a dash of corn syrup, the different sugar molecule helps stablize the caramel.) When golden brown add Sauternes and stir to dissolve. Add the fruit, cinnamon, and the curry and simmer until the quince is soft. Keep warm for seared foie or cool to make Vieux Gras. Cleaning and portioning the foie. Plating with the aged Balsamic. ***How'd you make that giant ice cube you ask? Simple, get yourself some of these ice trays from the MoMa store to delight your friends at your next gathering. Awesome post. I've got to try that foie gras infused cognac as soon as I get my hands on some foie gras. Out of curiosity, what is the recipe for the dish itself? Once you've got the sauce (and the foie gras) the rest of the dish is super simple. Just season the slice of foie with salt and pepper, sear it quickly on both sides in a very hot preheated nonstick pan, then slap it on a piece of toasted brioche, spoon on some sauce, and drizzle with balsamic. The cooking is very quick, like 30 sec maybe? You just want it to get a light crust and warm and soften the middle. If you cook it longer it just renders more fat so you end up with less to serve. Very cool...and very Escoffier of you to do foie-gras infused Cognac! I'm impressed.